On the evening of Queen of the South’s 90th anniversary, March 21st 2009, Bobby Black from Thornhill was sitting with a small group of family and friends round a table at Palmerston Park. Bobby was approached and asked if he would be OK to give an interview for qosfc.com. Quick as a flash, one of the ladies sat with Bobby replied, “You’d better watch yourself, he swears a lot”, to a cackle of universal laughter from those round the table. As the interview progressed Bobby was approached numerous times as the clock ticked on, with reminders from friends that it was time to go. Bobby’s reaction to these reminders was repeatedly the same throughout, “I’ll only be five minutes”. As Bobby said himself early in the interview, “I thought that mid 50s team was the team that I was likely to meet today. Who turned up? Jim Patterson and myself, we it seems are the only remaining survivors of that team. I’m 82, there’s a lot of things that I know from then and I welcome this opportunity to unburden myself.” Five minutes after five minutes became an hour. Bobby Black scored 120 goals from his 346 QoS first team appearances. He also played for an East Fife side that at the time were a trophy winning power in Scottish football. Playing in the fine Queens team of the 50s, Black was also capped by the Scottish League. He is intelligent, articulate, eloquent, sometimes philosophical and with a streak of cheeky humour that is never far away, he’s also good fun. This is the story in his own words of the sporting career of Bobby Black. Bobby Black debuted for East Fife playing in the war time league scoring in a 6-1 home win against Dundee United. The date was May 12th 1945. Over the next three seasons the teenager played only occasionally for the first team while he still developed. Black played at East Fife during undoubtedly the best decade in the club’s history when teams who under-estimated them were made to suffer. One of the greatest club managers in Scottish football history, Scot Symon, landed his first managerial appointment in June 1947 at East Fife. The club was immediately transformed. As Black said himself, “There was a time when East Fife had the best winners’ record in the League Cup of any team in Scotland”. The Scottish League Cup was started after the Second World War. In 1954 East Fife became the first team to win the trophy three times. The Methil side also achieved consistent high placed finishes in Scotland’s top league. They produced a conveyor belt of internationals who played for Scotland while with the club; Allan Brown (a future team mate of George Farm at Blackpool), Henry Morris, George Aitken, Davie Duncan, Charlie Fleming and Andy Matthew (like Queens’ Jim Patterson, Matthew’s game for Scotland was v The Army and a full cap was not awarded). The start of Black’s breakthrough to the first team came at the end of Symon’s first season in charge. Black played in two league games, both in April, a 4-0 win at home against Stenhousemuir and scoring in a 4-3 win at Stirling. East Fife romped away to win the B Division title by 11 points. The Fifers were promoted to the top division of Scottish football. 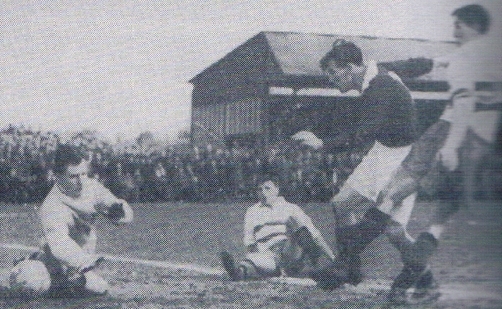 East Fife finished 1948/49 in fourth place with Black a first team regular in Scotland’s top tier. Black scored in a 3-2 home league win against Celtic and played in the Scottish Cup quarter final 2-0 win away against Hibs. He also played in the semi final defeat to Rangers. Queen of the South and East Fife both made the 1950 Scottish Cup semi finals. In a semi against Partick Thistle in front of 42,000 fans, East Fife made it to the final with a 2-1 win. The opponents of the Fifers in the final at Hampden in front of over 118,000 fans were Rangers, semi final replay conquerors of Queens. “When we played in the 1950 Scottish Cup Final against Rangers, we lost the services of our regular goalkeeper, John Niven, and the services of our reserve team goalkeeper, John McGarrity, on the same Saturday, which is quite unique. We were unfortunate enough to lose both our goalkeepers. The selectors gave a debut to the young third choice goalkeeper. He’d never played a senior game of football in his life before then and he got a Scottish Cup Final medal. He was no match for Rangers in those days. But I believe, and I still believe to this day that had we had our regular or even our second team goalkeeper, we would have beaten Rangers. We had already beaten them that year in the Scottish League Cup.” They had also drawn 2-2 in the league at Ibrox two weeks before the final. The unfortunate young Gordon Easson was thrust into the East Fife goalkeeping spotlight, replacing McGarrity as the only change from the line up who had won the League Cup Final. Willie Findlay put Rangers ahead after 30 seconds. Willie Thornton aded two more as Rangers ran out 3-0 winners to lift the oldest trophy in world football. Black won a League Cup medal with East Fife in that season of 1949-50. Hearts were among those taken care of in the group phase by Black’s team. When the semi final draw was made the two strongest sides in Scottish football of the era, Rangers and Hibs were drawn apart. East Fife knocked out Rangers in the 2-1 victory that Black referred to above. The Fifers were hit by tragedy though. When Charlie Fleming scored in extra time what was to be the winner, John McArthur watching in the stand collapsed and died from a heart attack. In the other tie Dunfermline also won 2-1 in eliminating Hibs to give the shock result of the tournament. It was to be an all Fife final. In the final there was no slip up from the Methil side in the way Hibs had banana skinned against the Pars - a 3-0 victory took the trophy to Bayview for the second time in three seasons. In his most eye catching league result that season, Black scored as Celtic were thumped 5-1 at Bayview. Black and East Fife finished fourth in 1950 for the second year running. The season after showed how far they had come when a tenth placed finish was a disappointment (a mid season results slump was the source of the club’s woes). Black was again a first team regular throughout. Things were very different for Black in 1951/52 – he played in only four games all season. Black continued, “I remember playing against Berwick Rangers for Queen of the South. And Walter Johnstone, the chairman of Queen of the South, he came in to the changing room to congratulate me on my, either equaliser or winning goal, I think it was the winning goal [Queens won the Scottish cup tie 3-2 on Feb 7th 1953 with a last minute winner]. At that time Billy Houliston, Queens legend, he was playing for Berwick. I was so influenced by one of the Berwick Rangers players. I said, ‘Sign that bloke that was playing, a bloke called McGill’”. Jimmy McGill signed for Queens the following September. Charlie Brown commented in a separate interview, "Bobby Black was a quality player. Black and McGill, the pair of them tearing down the right together." He continued, “I’ve got my opinion on what went wrong, it’s just my opinion. Nearly 20 years as a professional footballer. You can’t win them all, and you’re just as often wrong as you’re right. I had many happy recollections of that time. Most of the times you’ve got to depend on the press and the press’ opinion. I’ve got things in my scrap book that say, “Queen of the South don’t realise how good they are, they only need somebody to convince them that they are.” I thought that’s a real tribute, it wasn’t just one pressman that said that, there were several of them said they [i.e. QoS] just need somebody to tell them,” laughed Black now back in cheerful tone. “What about another of your comrades in arms on the right hand side, Dougie Sharpe?" “I don’t know, it’s just a feeling that you’ve got. I mean when I got my two goals against the League of Ireland, I’d wandered out of position as well. The purists would have been saying, ‘get out on the wing, get out on the wing’. “Total football”, Black laughed back. “Queens Park, he was an amateur. I meant to say, well I wouldn’t like to tell you exactly what I said to him, cause I didn’t know whether to call him Sir Alex or Alex,” laughed Black. “Did I?” asked Black with uncertainty. 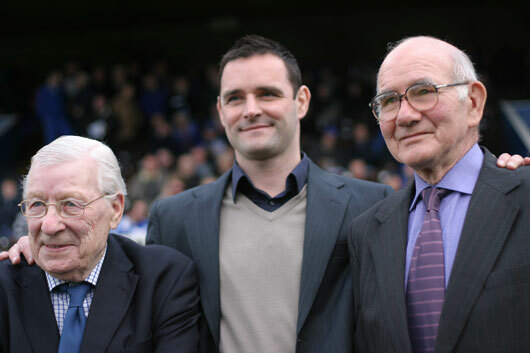 (We three kings - On the left is Bobby Black on his return to Palmerston Park for Queens’ 90th anniversary, 21st March 2009. With Black is his fellow ton up club members, Andy Thomson and Jim Patterson). Bobby Black is down in football history as a League Cup winner with East Fife and a Scottish League internationalist. He is still second in the Queen of the South goal scoring charts with 120 and fourteenth in the club’s appearances list with 346 (as at 3 November 2017). With his sense of humour, he would probably prefer to be described as, ‘The finest wanderer out of position in the history of the club’. And while certain words have been removed from this transcript in line with Queens’ status as a family club, despite the warning that was given, he doesn’t swear that much. * Bobby’s son, young Bobby Black, played for Queens between 1971 and 1973 making 35 appearances scoring four goals. Young Bobby joined Queens from St Cuthbert Wanderers in Kirkcudbright. * Russell Black, another son of Bobby senior, played 14 league games for Sheffield United during seasons 84/85 and 85/86. 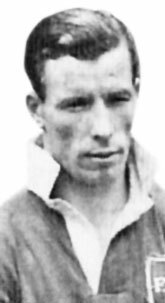 Also with the Blades at this time was his fellow Dumfries born player, Don Peattie, who played five league games for Sheff U. Russell scored in his league game on loan at Dundee before spending two seasons at Halifax Town. In his two seasons there he scored 14 goals in his 72 league games. He bookended his time in the senior ranks by playing at Gretna. * The family connection at Halifax continued with Bobby’s grandson, Toby Paterson, who played a league game for the Yorkshie club in 1988/89. Paterson moved to Australia playing for Frankstone Pines, a club formed by Scottish Australians in Melbourne in 1965. A former Scottish schoolboy internationalist, Toby has also been on the books at Celtic, Gretna and Annan. * At Halifax another Paterson grandson of Bobby’s, Jamie Paterson, also born in Dumfries, joined the first team for four seasons after playing for the youth side. He next spent season 94/95 at Falkirk playing in four league games. Next was two seasons at Scunthorpe where the midfielder scored twice in his 55 league games. He then returned to Halifax for a further three seasons before spending four at Doncaster Rovers. After Donny he dropped out of senior football by joining Barrow. * Denny Johnstone is Bobby’s great grandson, another born in Dumfries. Johnstone has played football professionally in Scotland and England and represented Scotland numerous times at age group level. * Brodie Paterson is also Bobby’s great grandson and like Johnstone has played international football at age group level, in Paterson’s case for Australia. On 1st January 2013 Bobby Black was announced as being a 2013 inductee into the Queen of the South Hall of Fame.